This article analyses the fallacy of wrenching from context, using the dialectical notions of commitment and implicature as tools. The data, a set of key examples, is used to sharpen the conceptual borderlines around the related fallacies of straw man, accent, misquotation, and neglect of qualifications. According to the analysis, the main characteristics of wrenching from context are the manipulation of the meaning of the other’s statement through devices such as the use of misquotations, selective quotations, and quoting out of context. The theoretical tools employed in the analysis are pragmatic theories of meaning and a dialectical model of commitment, used to explain how and why a standpoint is distorted. The analysis is based on a conception of fallacies as deceptive strategic moves in a game of dialogue. 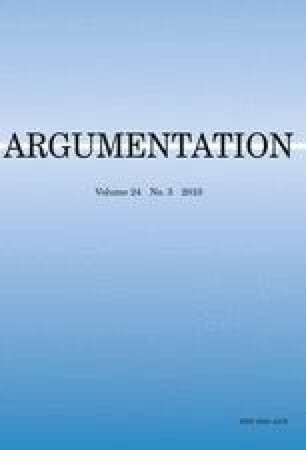 As a consequence, our focus is not only on misquotations as distortions of meaning, but on how they are used as dialectical tools to attack an opponent or win a dispute. Wrenching from context is described as a fallacy of unfairly attributing a commitment to another party that he never held. Its power as a deceptive argumentation tactic is based on complex mechanisms of implicit commitments and on their misemployment to improperly suggest an attribution of commitment. Douglas Walton would like to thank the Social Sciences and Humanities Research Council of Canada for a research grant, ‘Argumentation in Artificial Intelligence and Law’ that supported the work in this paper. Fabrizio Macagno would like to thank the Università Cattolica del Sacro Cuore of Milan for a research grant. A Freeper’s Introduction to Rhetoric. 2004. Retrieved from Free Republic: http://209.157.64.200/focus/f-chat/1051339/posts. Accessed 4 May 2009. Baggini, J. 2003. Bad moves: Selective quotation. Retrieved from Bad Moves Entry: http://www.butterfliesandwheels.com/badmovesprint.php?num=19. Accessed 4 May 2009. Gingrich: CNN Misquote in Palin Interview Shows ‘The Fix Is In’. 2008. Retrieved from FoxNews.com: http://www.foxnews.com/story/0,2933,443712,00.html. Accessed 6 May 2009. Internet of Lies. 2005. Retrieved from Snopes.com: http://www.snopes.com/quotes/internet.asp. Accessed 6 May 2009. Limbaugh misquoted Obama on home values, used it as evidence of Obama “talking down the economy”. 2009. Retrieved from Media Matters: http://mediamatters.org/research/200902190019. Accessed 6 May 2009. Nooriala, C. 2004. Out of context and out of line. Retrieved from The Cyrus Report: http://www.cyrusreport.com/Archive/4-12-04%20Out%20of%20Context%20and%20Out%20of%20Line.html. Accessed 4 May 2009. Obama: Messianic or Just Misquoted? 2008. Retrieved from New York Daily Intel: http://nymag.com/daily/intel/2008/07/obama_messianic_or_just_misquoted.html. Accessed 5 May 2009. Quayle quotes. 2007. Retrieved from Snopes.com: http://www.snopes.com/quotes/quayle.htm. Accessed 6 May 2009. Straw Man. 2009. Retrieved from Webster’s Online Dictionary: http://www.websters-online-dictionary.org/st/straw+man.html. Accessed 4 May 2009.